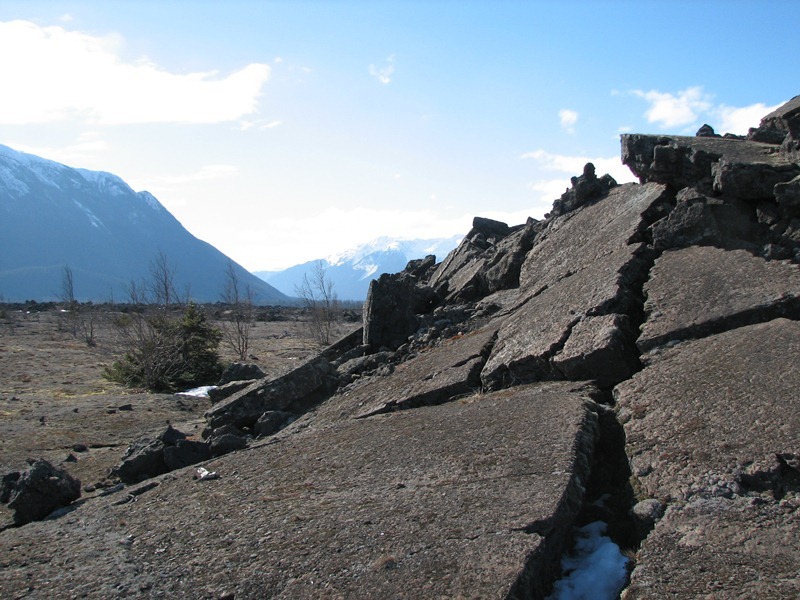 NISGA’A MEMORIAL LAVA BED PROVINCIAL PARK | British Columbia ROCKS! Approximately 300 years ago a volcanic eruption took place in the Nass Valley, originating from the Tseax Cone. This area, about 80 kilometers north of Terrace is accessed by driving the Nisga’a Highway originating just west of the Canadian Tire Store in Terrace, off Highway 16. The eruption and subsequent lava flow covered two villages killing at least 2000 people. In 1992 by Order in Council the Province made the area a Provincial Park. In 1995 the park was expanded and included in the Nisga’a treaty of 2000. This is a hauntingly beautiful region. 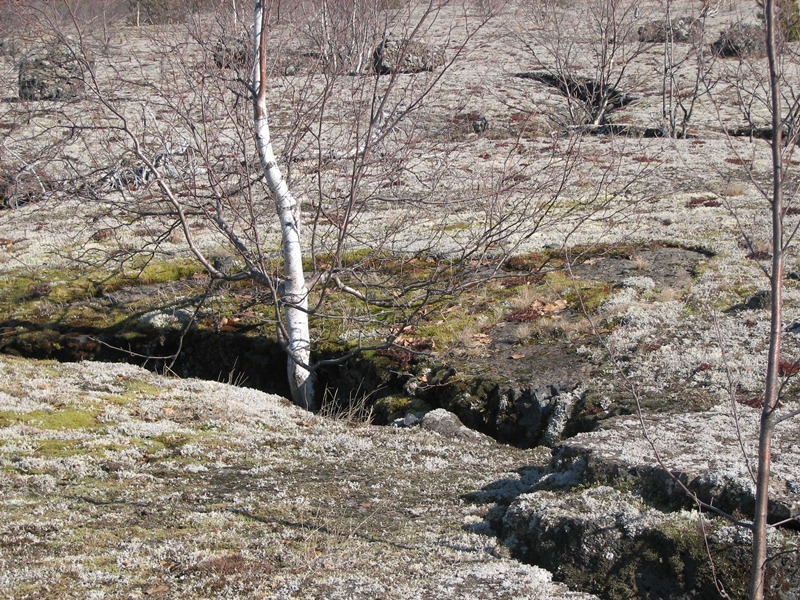 In some areas the lava rises 34′ above the highway as it meanders between lakes and upthrusts. The lava flows offer a spectacular view of what Mother Nature is capable of. This flow, from the Tseax Cone travelled miles and covered a very wide area. Gazing at it you can see upthrusts, large cracks where trees or other plant life now grow and yet other areas where cavernous holes can be seen. Driving past Lava Lake on the way to the area you can see the change in landscape and will notice a light lichen growth in many areas. Walking over top of the lava is frowned upon as the Nisga’a Memorial Lava Bed is just that, a memorial for the 2000 people that died here. There are some trails you can use and the Nisga’a Government also have tours (at a cost) through portions of the area. Enjoy the area. The Nass Valley is awesome so enjoy it. If travelling in the area late in the year come prepared for inclement weather as it can change quickly. 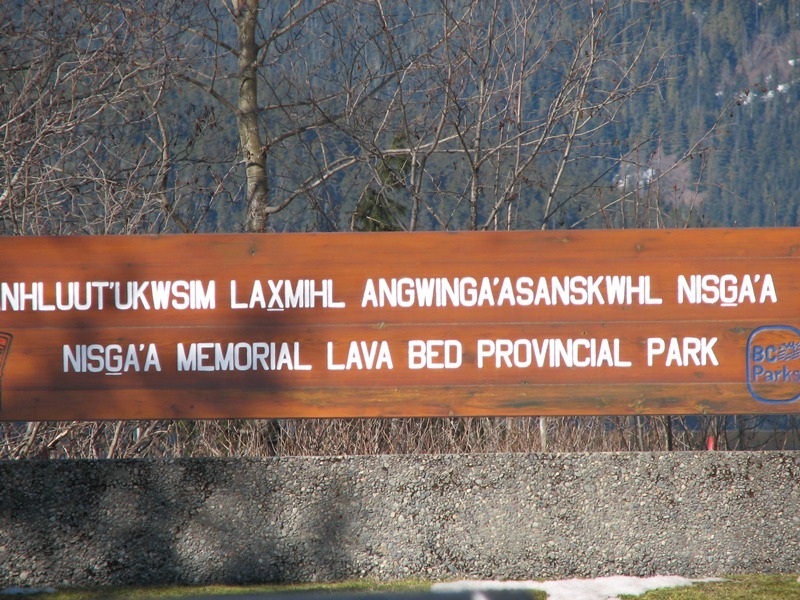 This entry was posted in British Columbia and tagged Lava Lake, nass, nass valley, nisga'a, Nisga'a Highway, Nisga'a lava bed memorial park, provincial parks, Terrace. Bookmark the permalink.